Houseguests can be a pleasure to host if they’re courteous and polite, which thankfully is most often the case. Unfortunately, though, most of us have also experienced the “other” kind of guests…the kind that take “make yourself at home” far too literally. They leave lights on, doors open, and seats up. Biofilm is the dental office’s equivalent of this kind of houseguest. This detestable microorganism-based muck shows up in your dental unit waterlines uninvited, ruins your expensive stuff, invites a bunch of friends over, and even tries to get in you in trouble with the law! 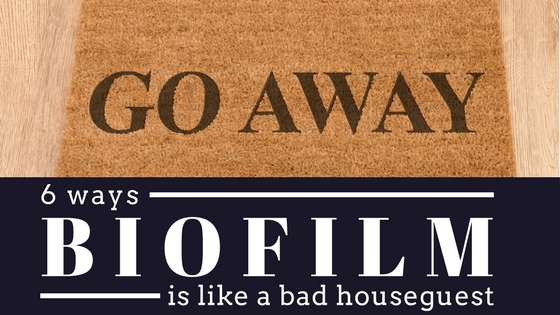 Read on for 6 ways biofilm exhibits the same cringe-worthy behavior as a bad houseguest, and information on how to give these pesky pests the boot. You’ve just changed into your pj’s and settled into the coziest nook in the couch when *ding dong,* uninvited guests…ugh! Same with biofilm. Even if your practice just installed brand new dental unit waterlines, the CDC reports that within only FIVE days, microbial counts can skyrocket to 200,000 CFU (Colony Formed Units) per milliliter. That’s over 400 times the recommended level. The extremely narrow design of waterline tubing promotes stagnation, and along with it, bacterial accumulation and biofilm growth. Once formed, biofilm acts as a reservoir that significantly amplifies the amount of free-floating microorganisms in the water. This can produce objectionable odors and even visible biofilm particles in the water exiting the system. It may start as one uninvited guest, but pretty soon they’ve group messaged their buddies to stop by and there’s even a pizza guy asking for your credit card to pay for the dozen pies that just got delivered! Biofilm operates in a similar fashion. In the early stages of contamination, the first bacteria adhere to interior waterline surfaces with a relatively weak bond which is fairly easy to break. If these initial layers aren’t immediately eradicated, however, they excrete a slimy, glue-like substance. This substance not only anchors the initial bacteria to the tubes, it traps new pathogens and particles passing by. A visible, filmy slime begins to build up rapidly. Imagine a visitor that just wiped his nose with his bare hands while explaining to you that he’s coming down with a nasty flu. He then proceeds to manhandle your TV remote. Rude and disguising, right? Ditto to biofilm. Dental unit waterlines contaminated with biofilm have been linked with cases of respiratory infection, pneumonia, and even one confirmed fatality from Legionnaires’ disease. Recently, More than 20 California children were hospitalized due to severe microbacterial infections which they contracted from a pediatric dental clinic whose water has tested positive for Mycrobacterium. Although infections associated with contaminated waterlines appear to be rare, it certainly places patients – particularly those who are elderly or immunocompromised – at unnecessary risk. “Whoops, I broke the set of crystal wine glasses you bought each other for your anniversary – they weren’t expensive, right?” Wrong! Bad houseguests seem to have a way of seeking and destroying some of your most “trea$ured” possessions, and the same can be said of biofilm. This nuisance can prove to be an expensive problem in several ways. As the pediatric clinic in California just learned, if your contaminated waterlines make patients sick you’ll need to stop performing all procedures involving water until the system is replaced (double whammy! ), if not shut down your practice all-together. If potential new patients catch wind that your office is reputed for bacteria-riddled water, it’s a safe bet they won’t be booking appointments with you any time soon. Who’s that knocking on your door at 2AM? It’s the police, coming by to follow-up on multiple noise complaints filed by your neighbors. GROAN…too difficult to explain that it’s all the uninvited guest’s fault. Looks like you’ll be paying for the ticket! Likewise with biofilm – when the CDC comes knocking at your door with fines for violating industry standard infection control principles, you’ll be footing the bill! In the CDC’s own language, “exposing patients or dental healthcare personnel to uncertain microbiological quality is inconsistent with accepted infection-control principles.” Possibly endangering patients and staff, coupled with hefty potential fines? The risk of non-compliance is simply too great. Rude houseguests tend to leave their bedding mussed, the refrigerator door open, and the toothpaste uncapped – and don’t even get us started on the throw pillow placement! Equivalently, boorish biofilm will never leave your dental unit waterlines in the same pristine condition they started in. In fact, they tend to engage in a bit of redecorating by producing a slime layer habitat for themselves and their buddies, providing them with a protective environment in which to multiply. Biofilm, a complex matrix of bacteria, fungi, and algae bound together in a sticky gel of polysaccharide, is by its very makeup, a mess. In fact, at this point we’d prefer a rude visitor’s trail of muddy boot prints over biofilm’s trail of goo. 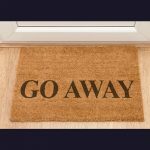 When kicking out a human who has worn out their welcome, a delicate approach may have to be applied in order to salvage your relationship. When giving biofilm the boot, however, it’s best to be direct. One method of eradicating biofilm which is supported by the ADA, is the use of chemicals. Certain chemicals remove, inactivate, or prevent the formation of biofilm. Chemical treatments such as DentaPure® cartridges are either continuously infused into, or intermittently added to, dental unit water. 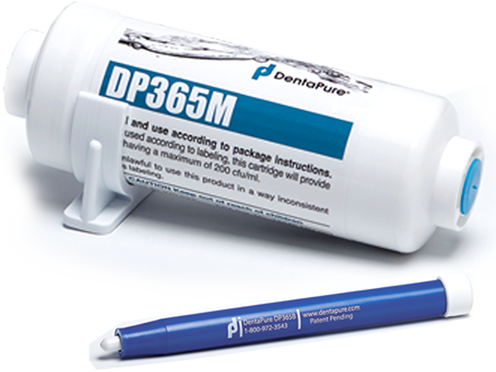 The DentaPure® cartridge is a simple, safe, point-of-source system for both bottle and municipal systems. The iodinated resin-bead technology found in DentaPure® cartridges can safely and easily be utilized in all offices. Perhaps best of all, with this product you needn’t stress about constantly keeping nagging biofilm visitors at bay: simply install one cartridge every year, and you’ll get 365 days of compliant water. The DentaPure® cartridge is EPA registered to provide ≤ 200 CFU/mL, no testing required! Put those stretchy pants back on, reclaim your favorite spot on the sectional, and use the DentaPure® cartridge to close the door on unwanted biofilm bullies…at least for another year!